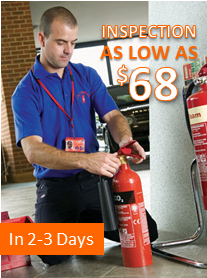 We will send a licensed technician to your location to perform a fire extinguisher inspection in 2-3 business days. This annual service is completed in accordance with applicable code in your city and state. When the inspection is completed there could be recommendations for corrective action; otherwise, the extinguisher will be given a compliance tag. Schedule Online Or Call (888) 627-9394. Bulk Discount is not available for this item.